The Center for Faculty Excellence partners with faculty to innovate and experiment with new approaches to teaching and learning.We help faculty leverage new educational technologies, without reinventing the wheel, to explore new technologies or classroom configurations. Interested in trying out a new teaching technology? What about collaborating with a colleague to design an interdisciplinary course? Heard about using movable furniture for small group work in a large class and want to see how it might work? Or do you want to give a mock lecture and receive feedback from CFE staff? 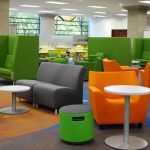 The CFE provides a fully equipped classroom in Wilson Library for faculty to experiment with emerging learning technologies, or figure out how to best use new, movable furniture. To schedule a consultation to use a new or emerging technology, or use our classroom in Wilson Library to practice a lecture or small group discussion, contact us at cfe@unc.edu. 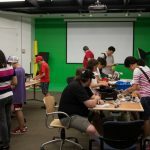 The CFE is partnering with the College of Arts and Sciences to support the Quality Enhancement Plan (QEP), with the theme of “Creating Scientists: Learning by Connecting, Doing, and Making.” Interested in teaching with any of the new MakerSpaces on campus? For information about available grants or other opportunities, please contact the Director of the QEP, Kelly Hogan or contact us at cfe@unc.edu. Most classrooms at Carolina were designed to emphasize the presentation of information from the front of the room. However, research shows that students learn and retain more information during class when they interact in constructive ways with other students and their instructors. 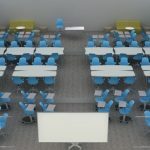 The CFE is offering a new series of workshops to help instructors make the most of classrooms being renovated under the recently announced Flexible Learning Spaces Initiative. 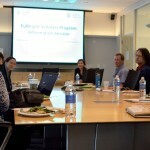 Many faculty are working hard to provide students with timely and useful feedback to facilitate learning. Depending upon the class size, subject matter, level of course, and other tools in use, any number of approaches and tools might work best. CFE staff are well-versed in the pedagogical and logistical aspects of course websites and learning management systems, including formative assessment tools such as polls and quizzes, as well as online presentation and web conferencing tools. In collaboration with the Lenovo Corporation, the CFE will work with faculty to fund new approaches for using technology in innovative ways in their teaching and students’ learning. Details about the CFE’s forthcoming grants program will be announced during Fall 2017. For more information about CFE/Lenovo Instructional Innovation Grants, contact us at cfe@unc.edu.